* Silver or Gold Figure? Antiqued Trophy 3613RTS by Montana Silversmiths. 3¼" x 4¼". Classy antiqued "retro" silver trophy buckle with four stones and up to three lines of engraving and your choice of figure. 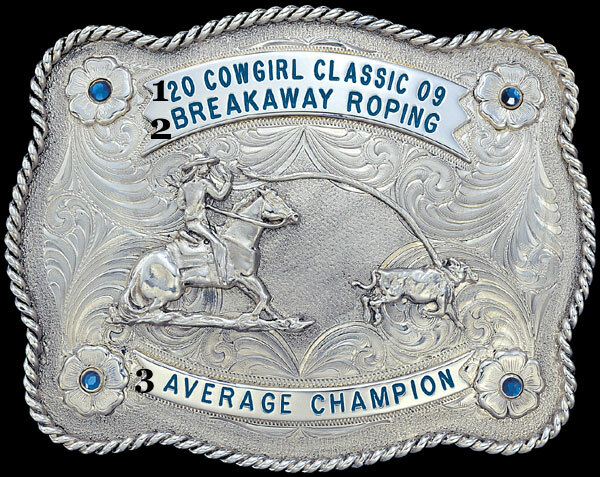 Shown here with Break Away Roper figure #581, sapphires and Montana Blue engraving.